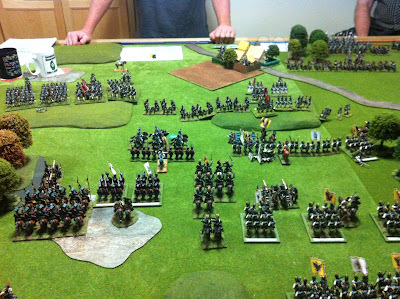 At the same time the French and English fight out Battle 1, another French force and the invading Austrian force come together near the eastern border with Piedmont. 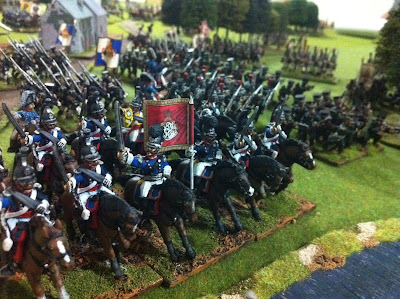 The French outclass their attackers with a heavy Young Guard Corps attached Guard Cavalry while the Austrian force is their main Corps comprising a number of Line Infantry Divisions, elite Advance and Light Brigades and a strong division of Grenadiers as well a small contingent of Wurttemburg troops. As a meeting engagement both sides deploy in medium rain. 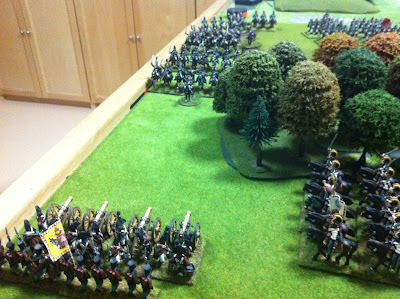 The rain reduced the visibility and so the forces deployed onto the field of battle without being able to see each other and losing a lot of their movement speed. Almost all formations continued forward through the rain. 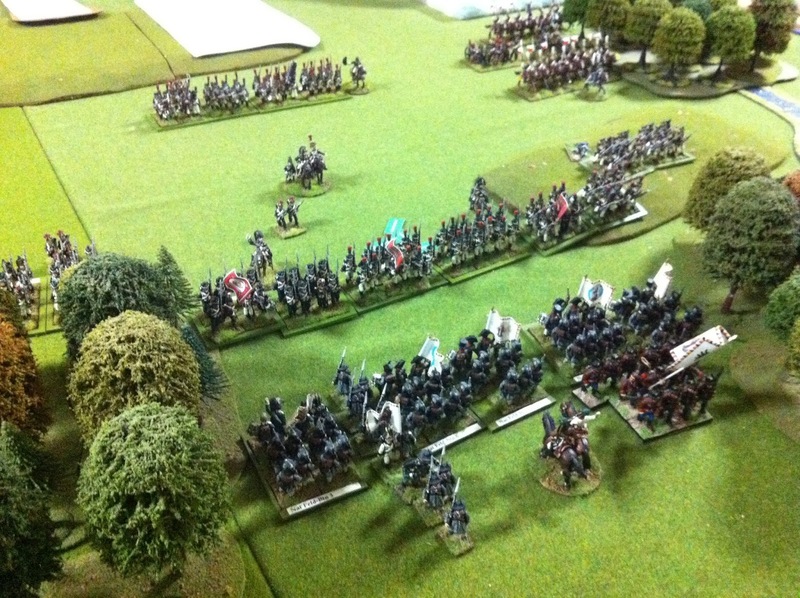 In the centre and on the Austrian right, contact was made. 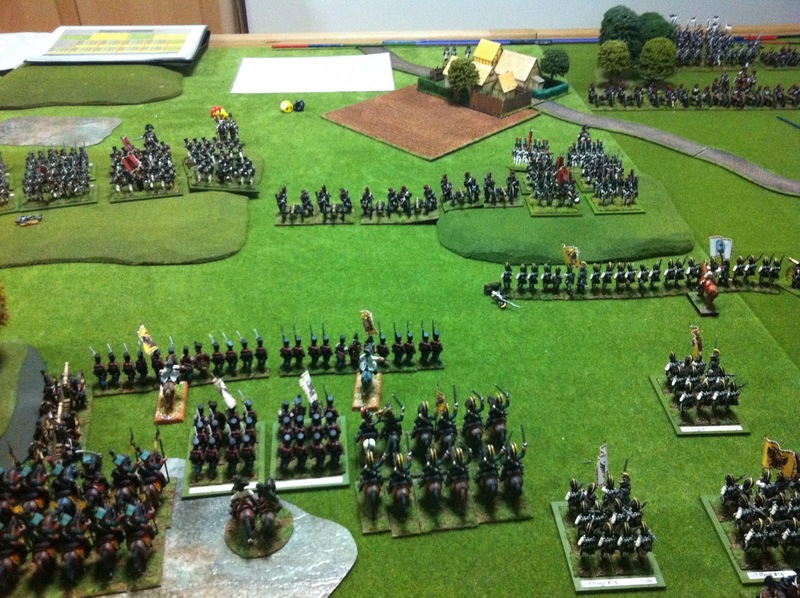 In the centre Austrian Hussars engaged French infantry in columns and on the right Austrian Landwehr engaged French infantry in columns. Austrian Hussars decided to take the opportunity heavy rainfall gives and they charge forward moving to line formation before they did. Their target was 4 battalions of French Young Guard Infantry who immediately formed closed columns. The change of formation triggered an opportunity charge but the unit failed to capitalise on that moment. Minutes later though, they successfully charged and while taking a small amount of artillery fire on the way in, they met their target with no loss. 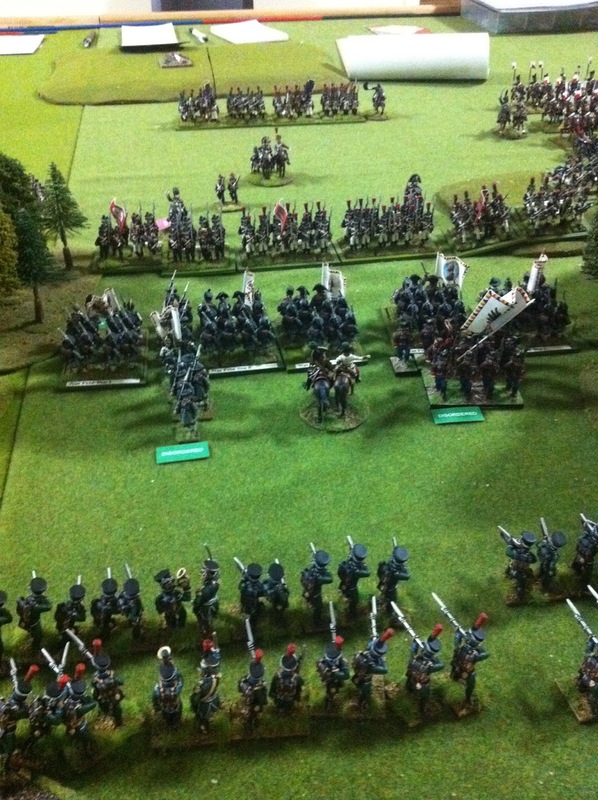 All 4 French battalions were routed and the Hussars continued to penetrate into the French lines. 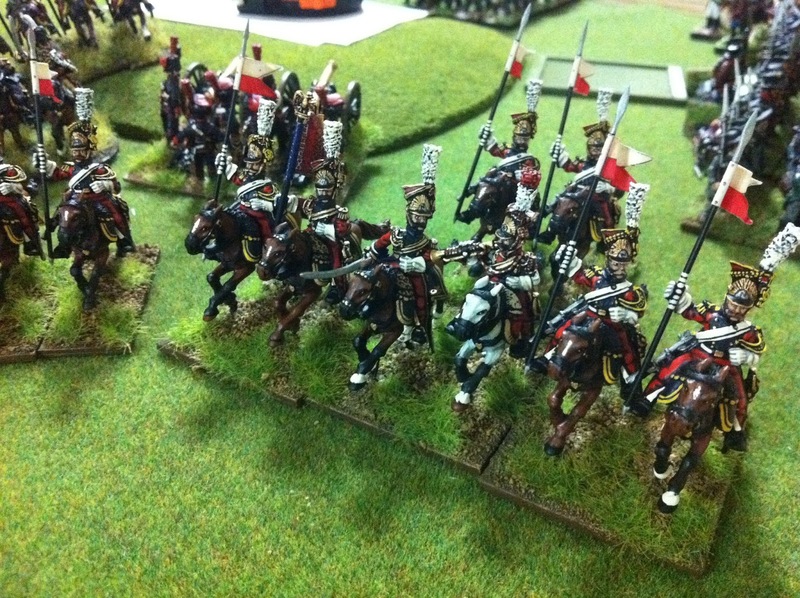 Another 2 battalions in the line of charge failed to form square and were also contacted. 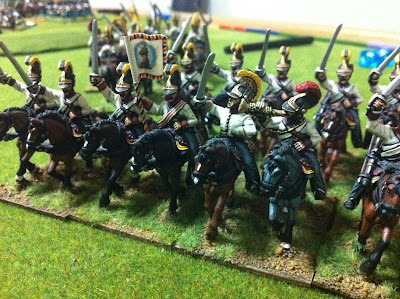 This time however the fatigue of the horsemen was too much and they failed to cause any damage and withdraw. A good start to the battle. 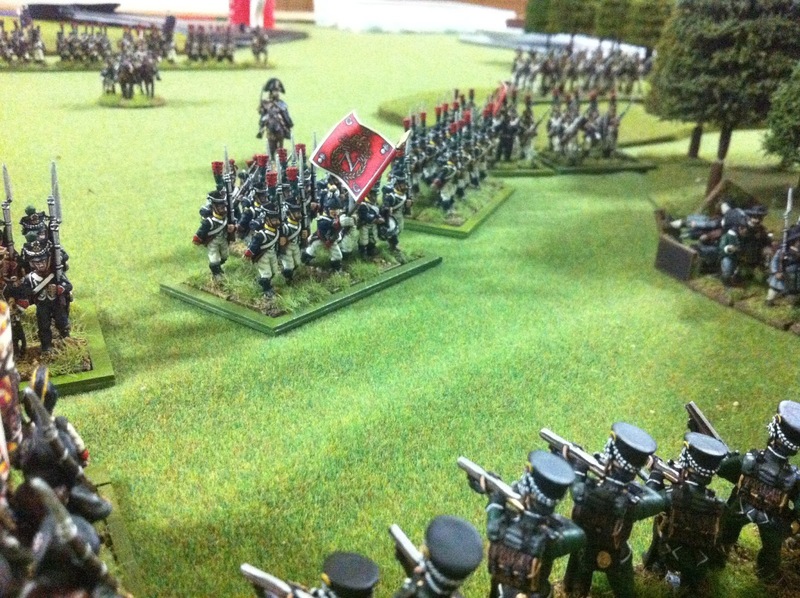 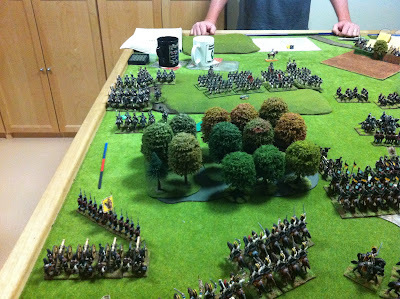 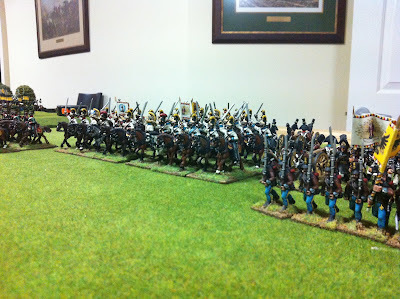 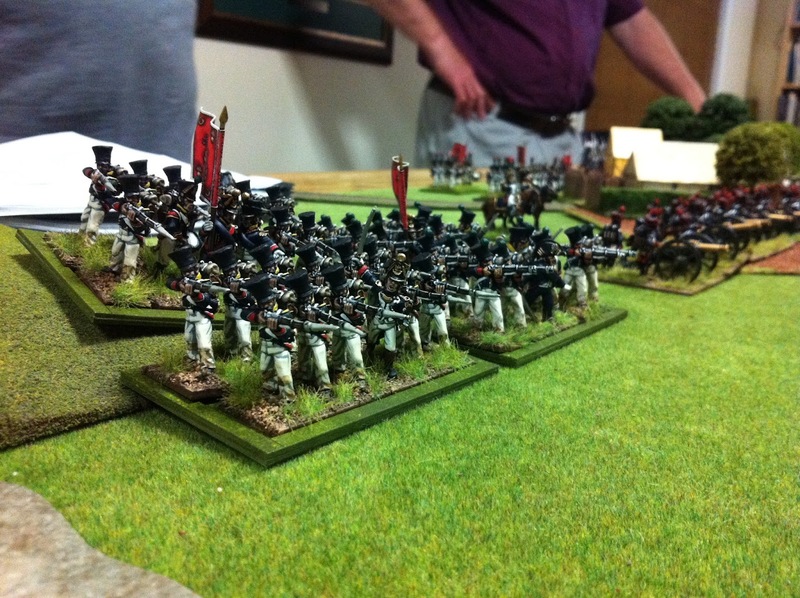 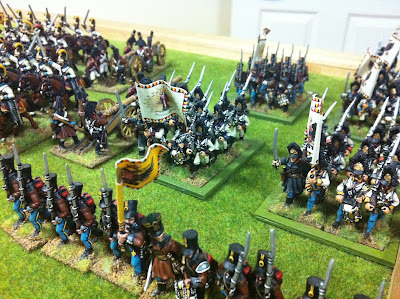 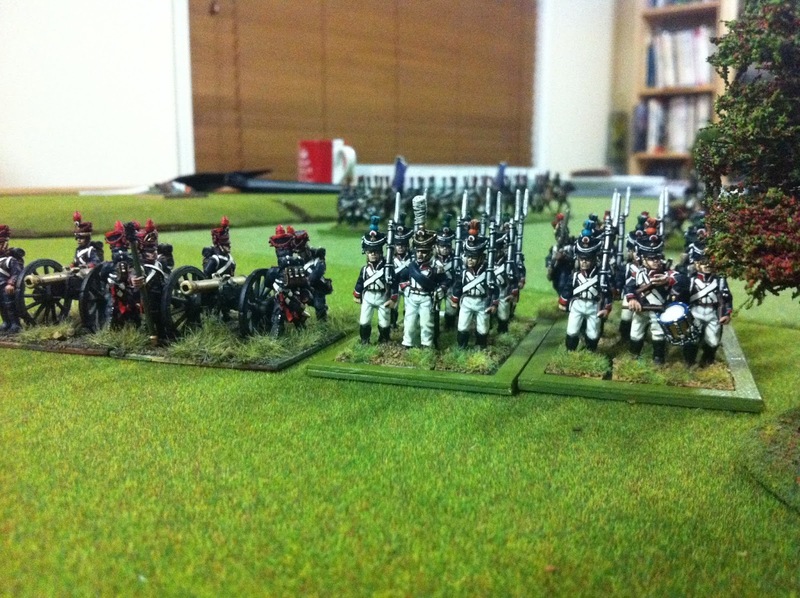 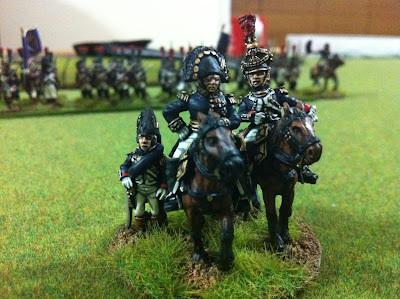 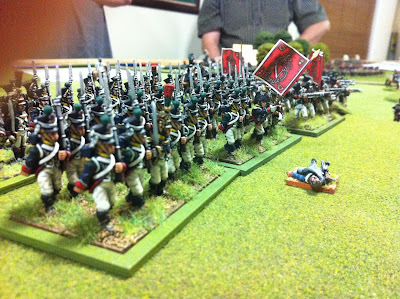 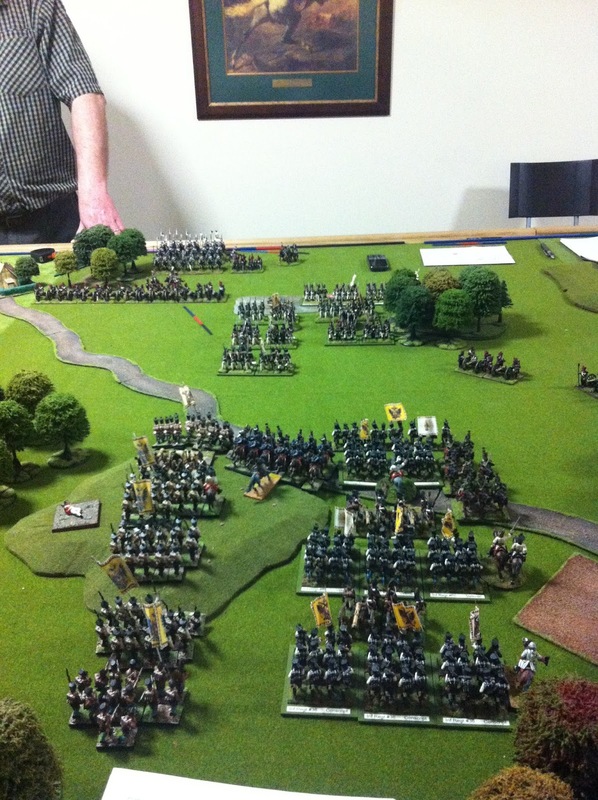 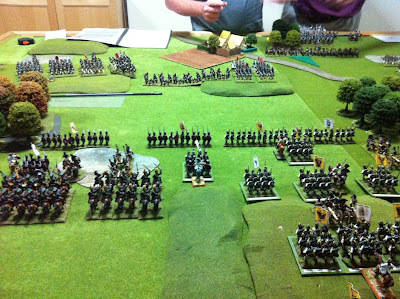 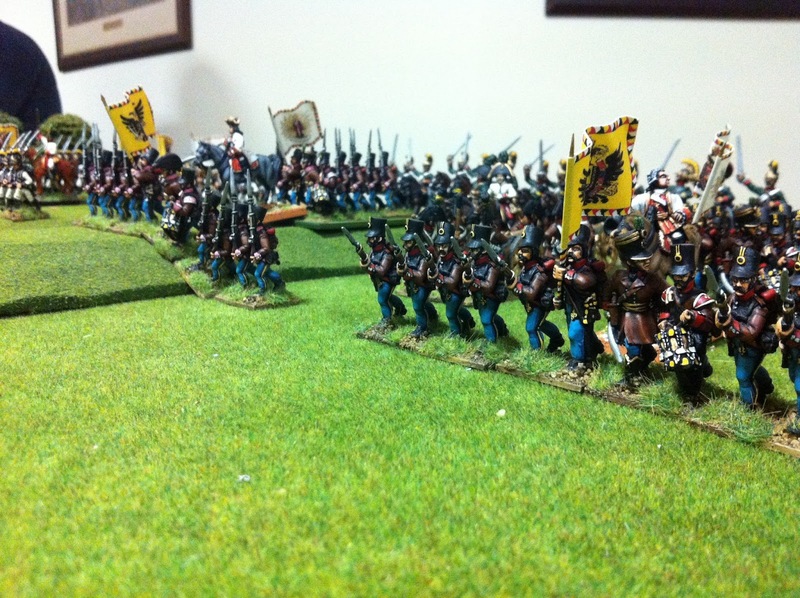 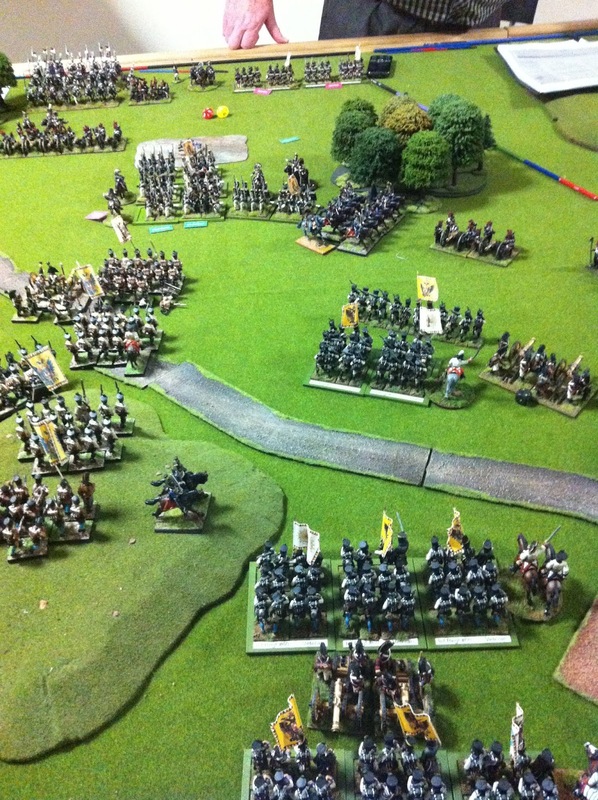 On the Austrian right, French Infantry in columns and Austrian Landwehr marched to close the gap between them. 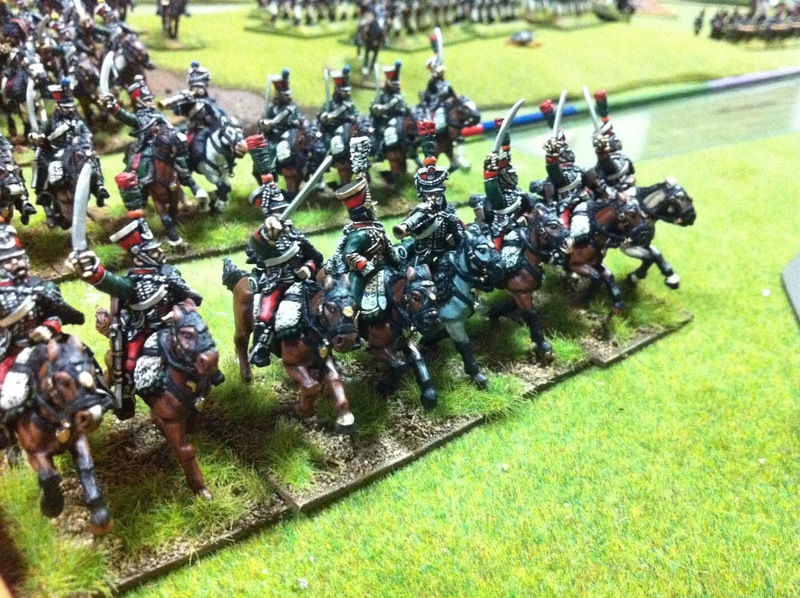 Rain forced them both to decide this engagement by the bayonet and the 1st line of Landwehr were routed. 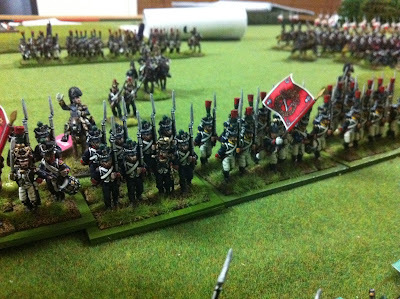 The 2nd line of Landwehr fared better and were pushed back but in disorder only and not routed. 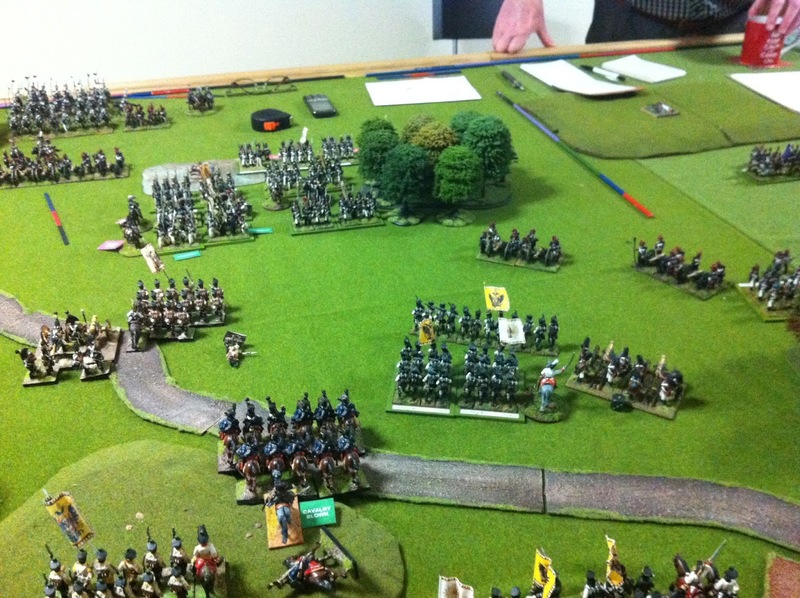 Austrian centre closes the gap between them and the enemy with Austrian Hussars on the left excited about the juicy formations ahead of them. The commander of the Austrians, Field Marshal Guylai personally delivered a order to a portion of the reserve made up of a brigade of Austrian cavalry and a brigade of Austrian Grenadiers to deploy with haste to cover the extreme left of the Austrian line where a French cavalry division was threatening to outflank the Austrian position. The remainder of the Austrian reserve, another brigade of Grenadiers, was ordered to move to the same position on the extreme right but the order failed to arrive in time. 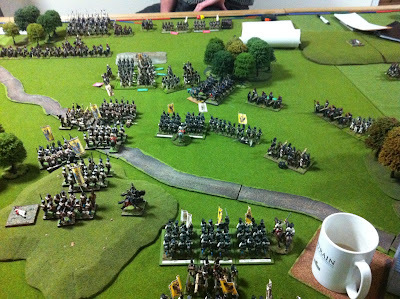 The situation at 1100hrs with French cavalry at the bottom of the picture threatening to come around the woods and the Austrian left. 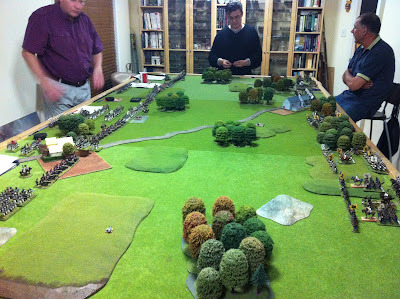 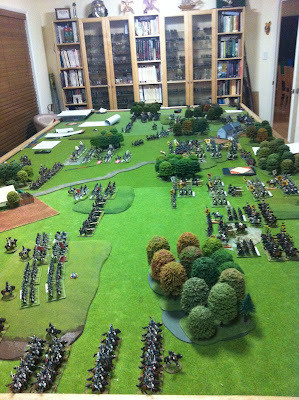 In the centre can be seen the 2 Austrian line divisions attacking in perfect unison with a small wood in between them. 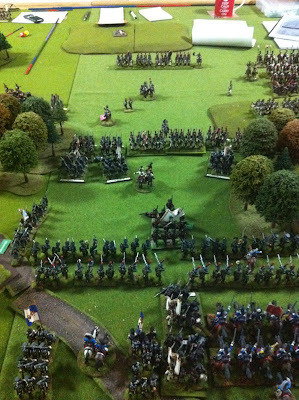 The Austrian attack in the centre left was now engaging the enemy troops before it. The lines made for slow progress but it also kept casualties lighter from the French artillery. The light brigades on the left here held their position in order to deploy artillery and ready cavalry to attack through the gaps while the line division on the right pushed forward and engaged the enemy infantry in firefights on the hill. 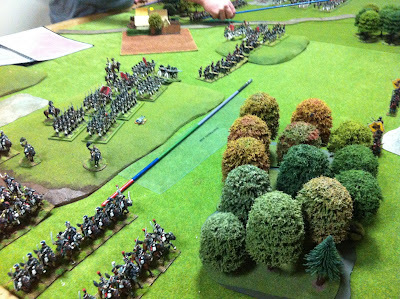 In the Austrian centre right, another line infantry division supported by a light brigade attacked forward as well. 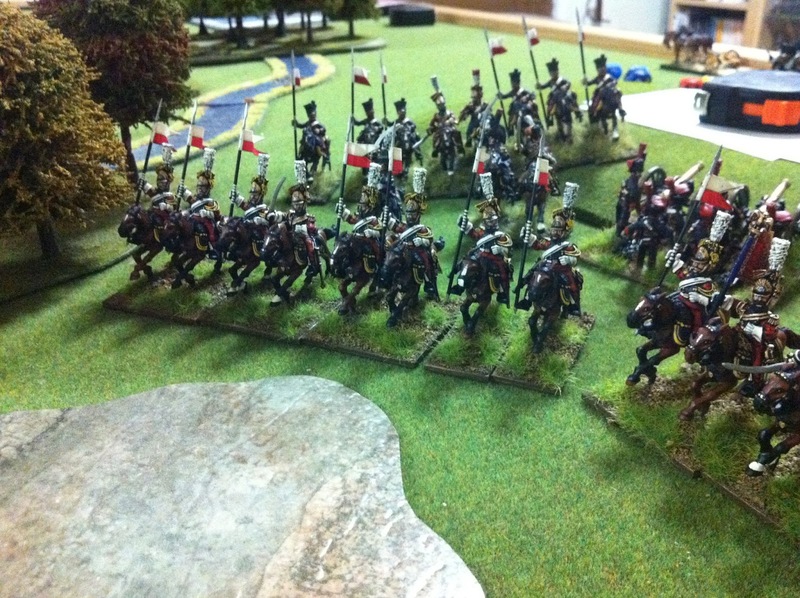 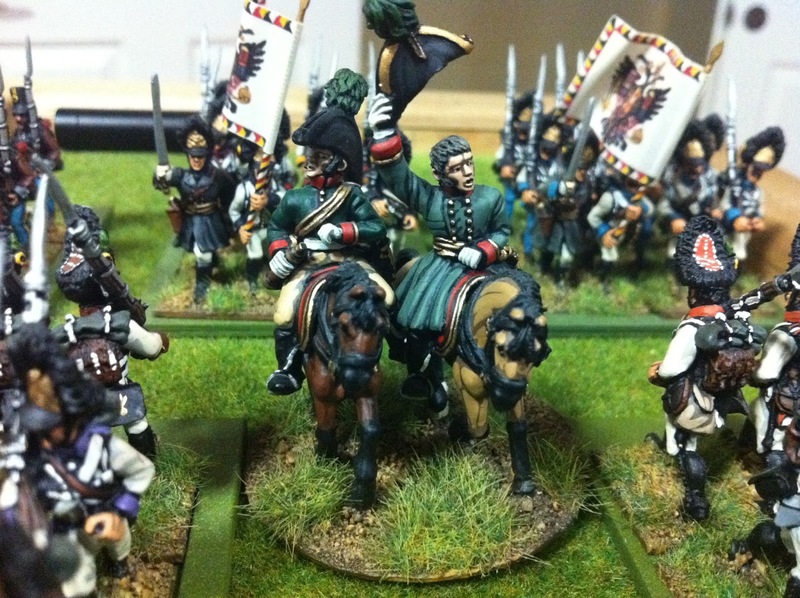 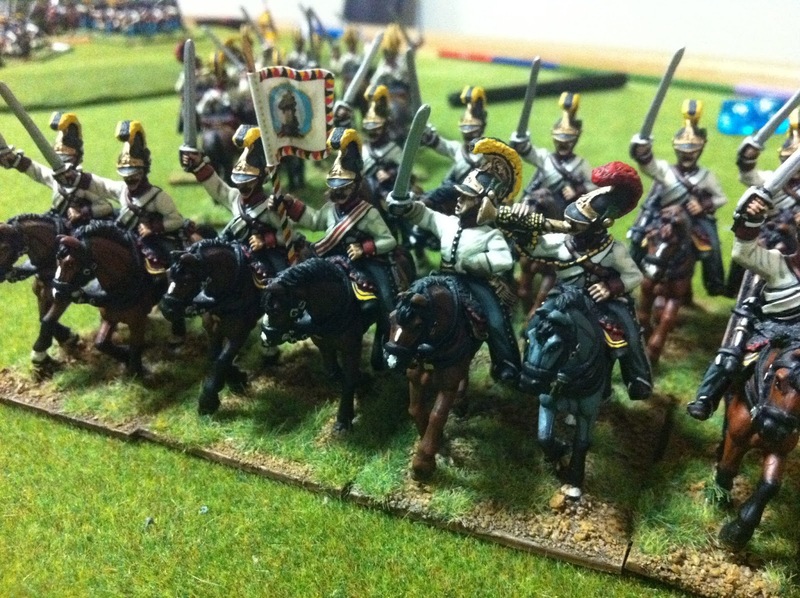 With 4 Young Guard battalions on the run from previous cavalry attacks, the Austrians were keen to send in the fresh Hussar regiment to cause more damage that the infantry could exploit. 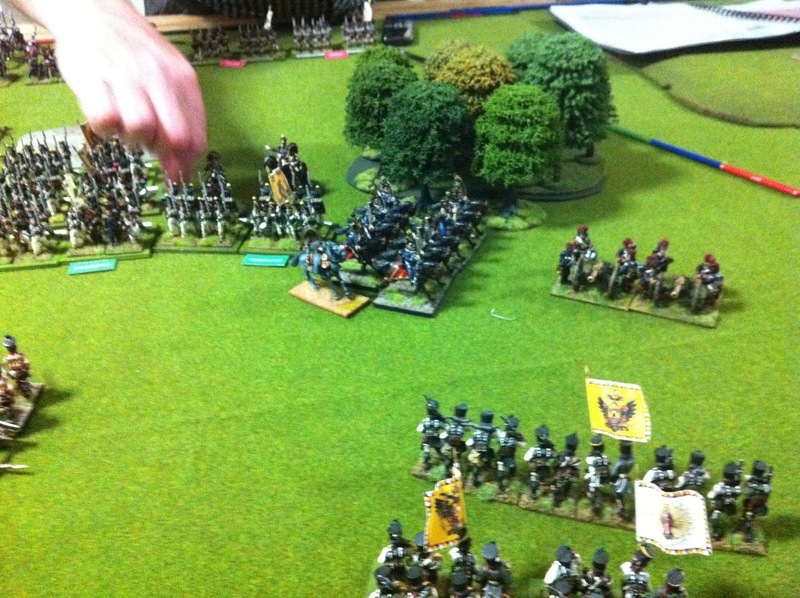 Another 2 battalions were scattered in a short time later. 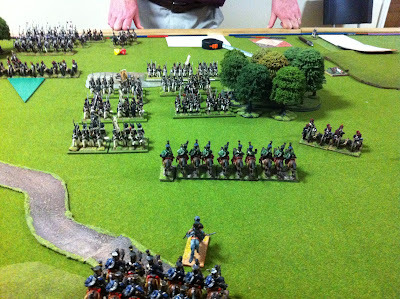 A fresh Austrian Hussar regiment in the centre move off the hill to line up a charge on 2 battalions of French Young Guard. 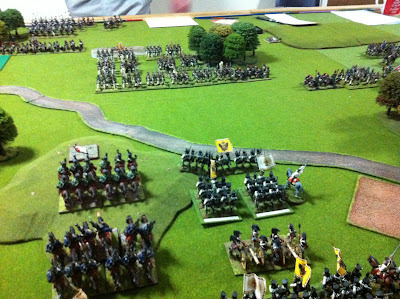 On the Austrian right flank, the Austrian Landwehr are charged and pushed back en mass with some routing and some withdrawing. Soon the whole formation was forced to withdraw and began breaking contact with the French infantry. The battle ends (2 x night maximum as per Campaign Rules) with the French in command of 3 points of strategic value on the table and the Austrians achieving only 1. That's a lovely looking battlefield! I would think that you'd be happy with how your Austrians went, given your low expectations against better quality opposition. 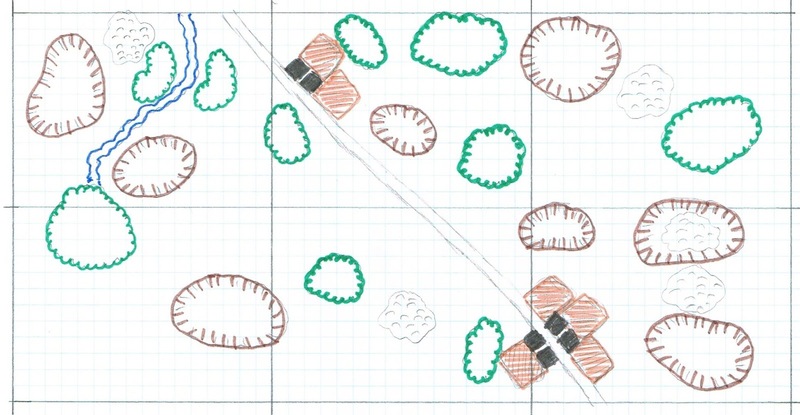 The left seemed to do well, but the landwehr on the right folded—and the grenadiers were not keen to help, eh? 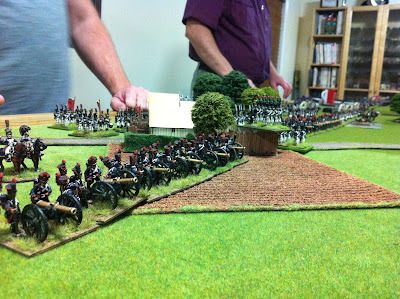 Yes James they did do quite well but things would have got a lot worse as time went on. Better quality troops can handle fatigue a lot better than less quality troops. 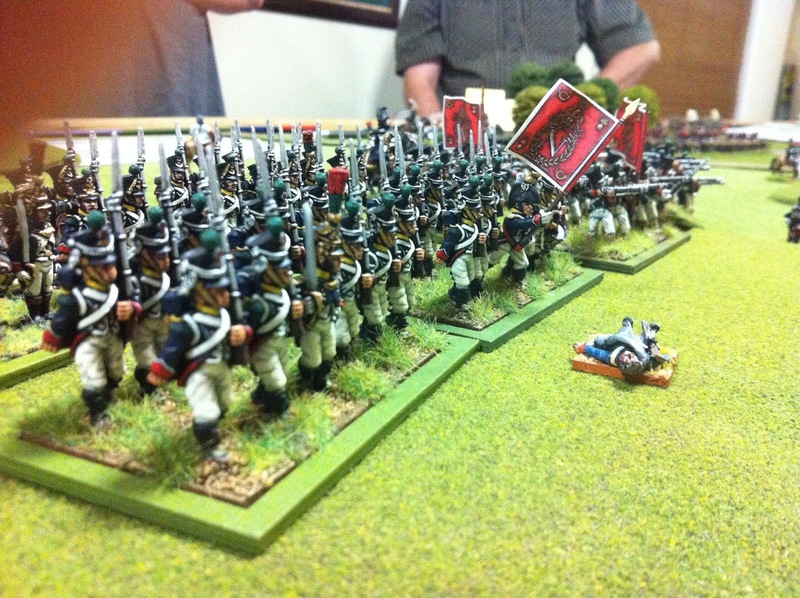 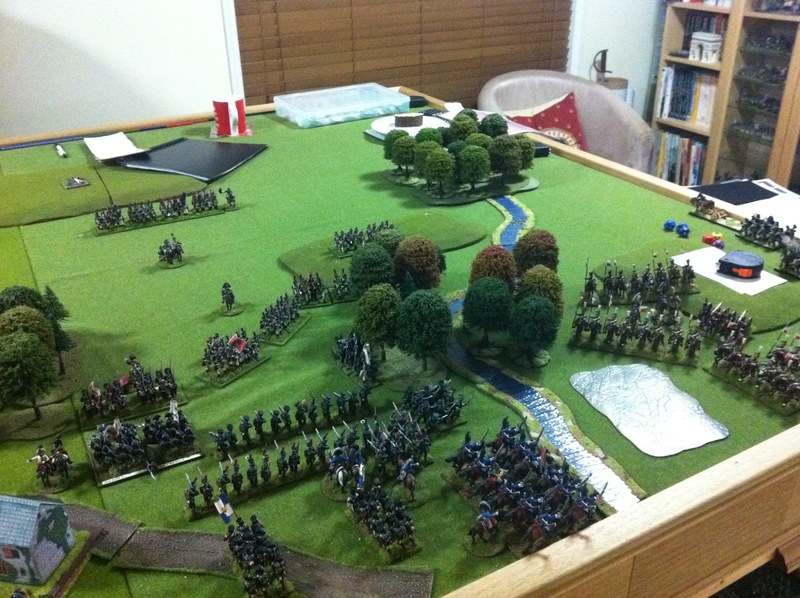 I knew the landwehr would fold but really just wanted them to see some action. 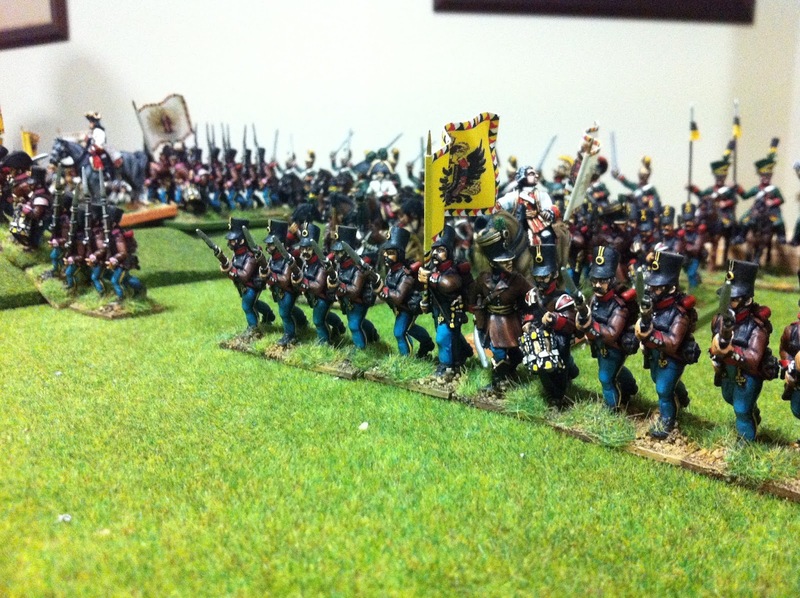 Behind them was a combined Wurttemburg division of 6 battalions of infantry and 1 regiment of cavalry and then behind them was a brigade of 6 Austrian Grenadier battalions. 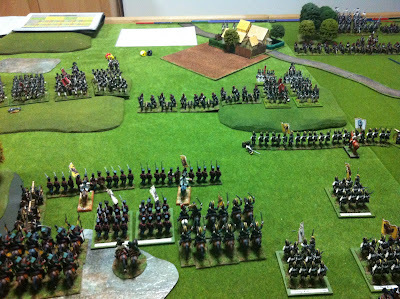 So it could have stood for a bit longer to enable my centre attacks to have pushed further. 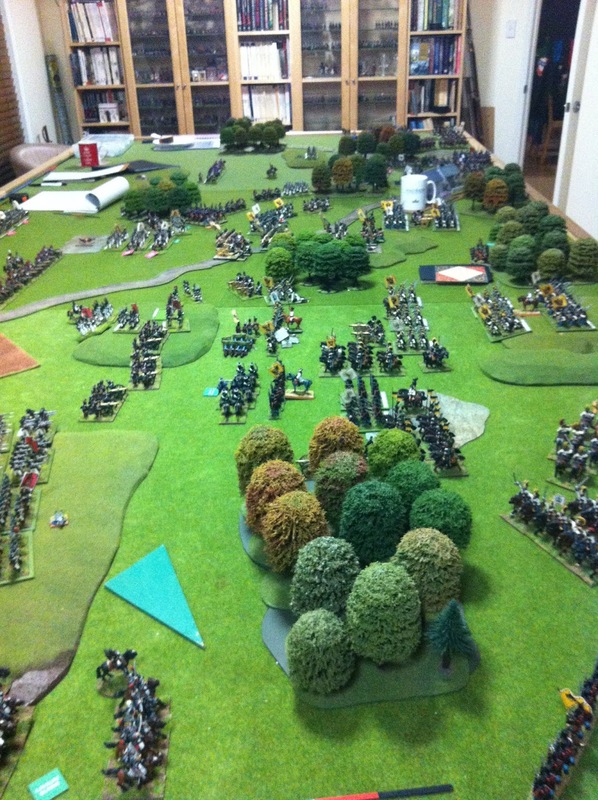 But with a 2 night gaming limit we will never see. Having said that we are throwing around a new rule to calculate the number of night gaming based on the combination of both army's total ACE ratings. 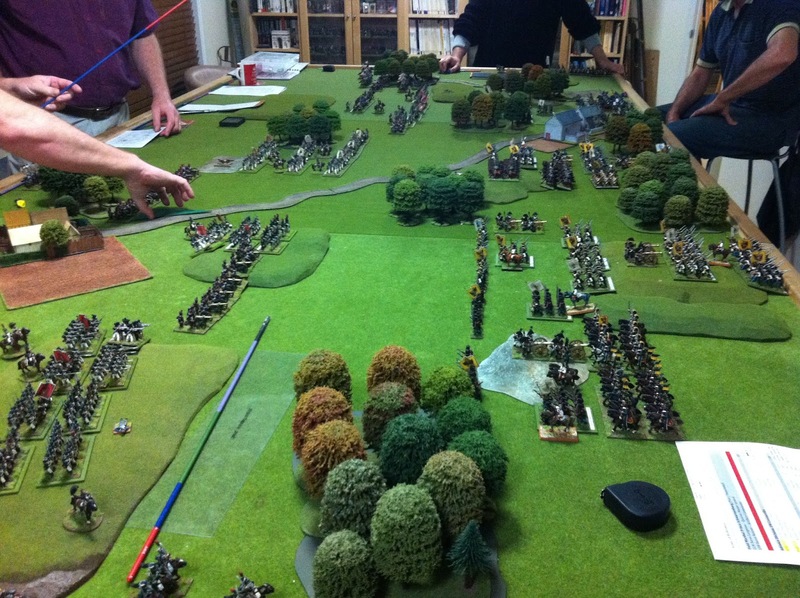 The idea is to have 1 night for every 4000 points. Nice report, a great looking battle! 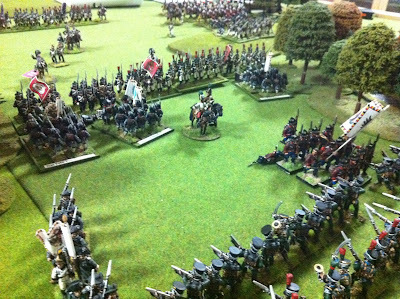 Fantastic loping game and your figure collection is just beautiful.